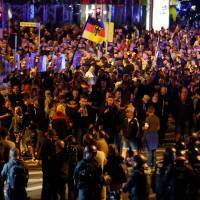 BERLIN - Germany will not tolerate “vigilante justice,” Chancellor Angela Merkel’s spokesman said on Monday, after hundreds of far-right protesters staged a violent demonstration in response to a fatal stabbing that authorities blamed on a Syrian and an Iraqi. 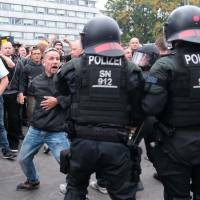 Sunday’s protest in the eastern city of Chemnitz was the latest manifestation of unrest since Merkel’s government allowed about 1 million asylum seekers to enter Germany in 2015, triggering a shift to the right in German politics. Television news channels broadcast amateur footage of skinheads chasing a foreign-looking man through the streets. Other clips showed hundreds of demonstrators shouting “We are the people!” a slogan used by far-right supporters. Police said around 800 demonstrators had taken to the streets on Sunday, hours after one man was killed and two other people were injured in the stabbing incident overnight. Local police were trying to avert further violence with additional protests scheduled for Monday evening. 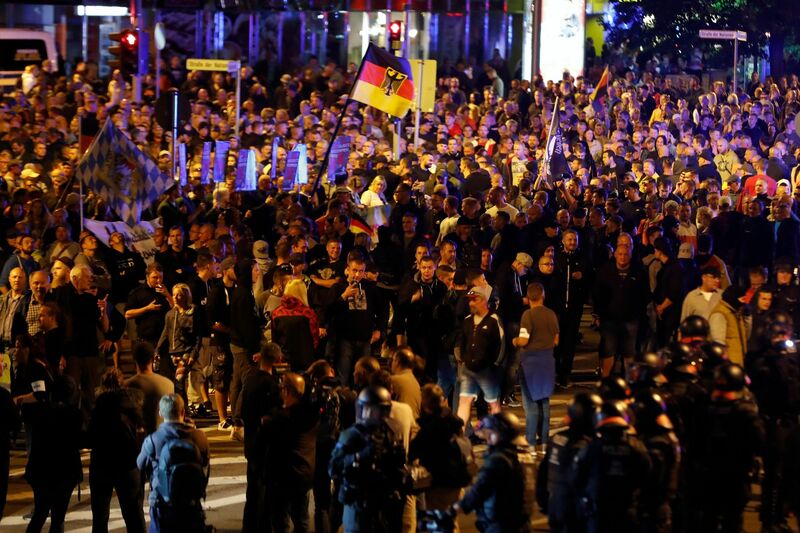 “We don’t tolerate such unlawful assemblies and the hounding of people who look different or have different origins, and attempts to spread hatred on the streets,” Merkel’s spokesman, Steffen Seibert, told a regular news briefing. 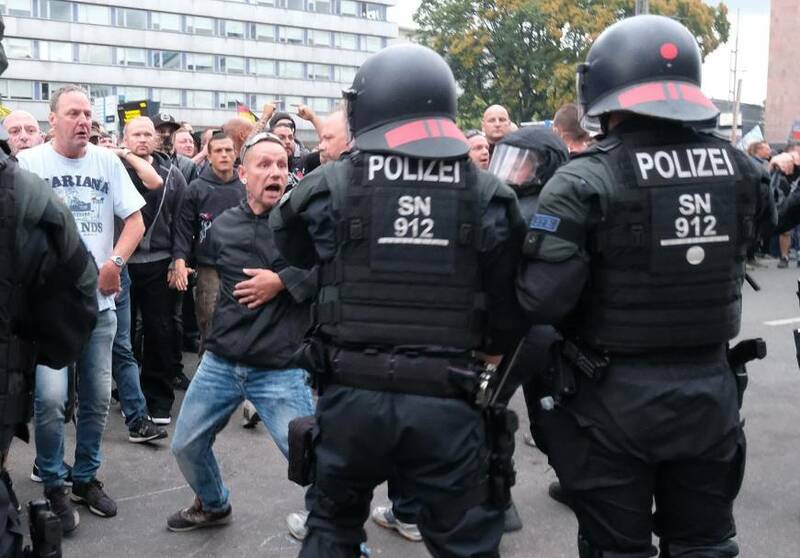 Roland Woeller, interior minister of the state of Saxony, which includes Chemnitz, said authorities would not allow “anarchists” to run rampant. Police said the stabbing occurred after a verbal altercation, but gave no further details. Local prosecutors said on Monday they had arrested two suspects, a 22-year-old Syrian man and a 21-year-old Iraqi man. No additional details were immediately available about the two men. Authorities have described the victim as a 35-year-old German man, and said two other German men, aged 33 and 38, were also wounded. Charges were also filed against four protesters at Sunday’s rally, including two charged with bodily injury. Some of the protesters had thrown bottles and rocks at police officers. Civilians were also attacked and harassed, including an 18-year-old Afghan man and a 15-year German girl, a police spokeswoman said. The demonstration followed calls on social media by far-right groups for protests over the man’s death. Chemnitz mayor Barbara Ludwig, speaking to reporters, appealed for calm and said outrage about the stabbing, while understandable, “does not justify violence against the state. Martina Renner, a lawmaker for the radical Left party, accused the far-right of trying to exploit a murder for its own political ends. Police in Chemnitz are preparing for further demonstrations. They were expected to issue a further statement about Sunday’s incident later on Monday.